90 per cent of processed water is recycled and ready for immediate re-use by the system. The new water management system has been designed using customer feedback to cater to CDE’s increased activities in industries related to industrial sands, and construction and demolition (C&D) waste recycling. The sixth product in the AquaCycle thickener range, the system has a capacity of 900 cu m per hour. Feed capacities across the AquaCycle range now span from 100 cu m per hour to 1,500 cu m per hour, with the A900 filling the gap for operators who want a feed capacity higher than 600 cu m per hour but lower than 1,500 cu m per hour. The AquaCycle A900 thickener has a capacity of 900 cu m per hour. The CDE AquaCycle water management system provides an efficient alternative to water extraction from natural sources by recycling up to 90 per cent of processed water, ready for immediate re-use by the system. Kevin Vallelly, head of research and development at CDE, explains the rationale for the development of this new product: “CDE has been co-creating with customers for over 20 years to deliver collaborative, imaginative and unique processing systems, and this process has been informing the development of new water recycling technologies dedicated to be highly performant across sand and aggregates, mining, C&D waste recycling, environmental, and industrial sands applications. 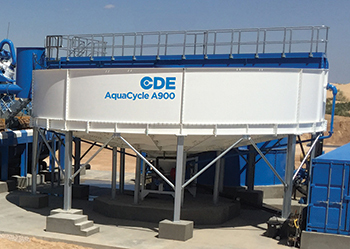 After 18 months of work on the conception, design, assembly, and testing of the new AquaCycle A900 at CDE’s headquarters in Northern Ireland, the prototype was successfully installed and commissioned on an industrial sands application in West Texas, US. After 1,000 hours of continuous successful operation in a harsh application, the product has successfully passed the testing criteria. CDE consistently invests in research to bring its water recycling equipment to the highest standards of efficiency, he continues. Its staple water management system, the AquaCycle, has given the company a significant edge over its competitors in the many markets in which it operates as it allows for the introduction of a single, compact and user-friendly unit on projects from low to high processing tonnages. CDE’s water management technology perfectly meets the conditions for a high return on investment including maximum production efficiency, minimum loss of fines and ultimate water saving. Elaborating on the operation process, Vallelly says: “After the raw material has been washed and classified, waste is sent to the AquaCycle thickener. In the AquaCycle, a small amount of poly-electrolyte flocculent is added to the water from the automatic dosing station which forces fine particles to settle on the bottom of the thickener tank. The clean water on the top overflows the weir and is stored in the AquaStore tank before being re-circulated around the plant, helping to reduce the amount of required fresh water for top up, down to 10 per cent. 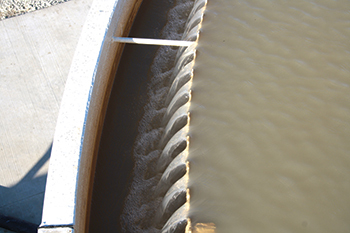 Optimal efficiency of water thickeners depends on stringent attention to detail when designing the water management system that fits the exact requirements of each operator’s site. “The A900 joins a very performant suite of CDE AquaCycle water management systems. Processing 900 cu m per hour and with a sludge capacity of 45 tonnes per hour, it is intended to give clients looking for a median alternative to the A600 and A1500 models the opportunity to acquire a product that is just right for their wet processing needs and site footprint requirements,” he says. All CDE equipment is designed on the basis of a plug-and-play ethos. The company stays ahead of the technological curve by developing highly efficient products adapted to all markets and environments whilst retaining customers’ needs for easy use and safety as a priority, including safe access for efficient maintenance and workers’ protection. The AquaCycle recycles up to 90 per cent of used water, promoting significant savings on the requirements for fresh water top-ups. The intelligent design maximises the settlement of solids within the smallest equipment footprint that requires minimal civils. The integrated FlocStation with automatic pre-mixed flocculent dosage allows for rapid settlement, whilst turbulence at the centre of the AquaCycle is reduced. The AquaCycle A900, like its sister plants of varied capacities, is highly resistant to wear: the wedge wire screen removes lightweight contaminants from the recycled water, protecting pumps from blockages. Downtime is significantly reduced as a result. With a tank diameter of 12 m and a weight of 54 tonnes when empty and 445 tonnes when full, the AquaCycle A900 features a small footprint. Intensive or systematic use of settling ponds can generate a significant loss of revenue for operators. For instance, it is not uncommon for high-value fines to remain trapped at the bottom of ponds. The use of ponds also requires for the operator to factor in extra space on site and expect downtime whilst the material settles, he points out. Vallelly continues: “The reality of a fast return on investment becomes very tangible when an AquaCycle thickener is added to a washing operation. “It maximises the efficiency of the wet processing plant by maximising the settlement of solids. This reduces the quantity of flocculent required as well as running costs and optimises the efficiency of the plant. Water management systems are increasingly becoming a must on quarries and mining sites as their benefit significantly outweigh the initial investment. Return on investment on an AquaCycle A900 is typically six to nine months. “The AquaCycle A900 is now available to operators across the world and is ready to complement wet processing applications in five sectors – sand and aggregates, mining, construction and demolition waste recycling, environmental applications and industrial sands,” he concludes.